This week I traveled 150 years back in time and through the activities of the Civil War via the Harper’s Weekly dated January 24, 1863. This issue contains a double-page illustration by Thomas Nast entitled “The Emancipation of the Negroes, January, 1863 – The Past and The Future.” Mr. Nast shows their present life in the center circle, of a happy home including a picture of President Lincoln hanging on the wall. The illustrations to the left show obstacles they had to endure — being sold at auctions and separated from loved ones, beatings, and being chased (if running away). The illustrations to the right show what they are looking to in the future with the implementation of the Emancipation Proclamation — owning a home, children going to public school, being treated fairly by the employer and being paid for working. 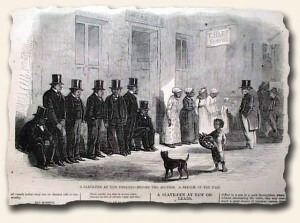 This illustration has an accompanying article that describes the illustration and also includes text from the Tribune of March 11, 1859, which dealt with the largest single sale of humans (slaves) in the United States. Mr. Pierce M. Butler of a city near Savannah, Georgia, sold 486 slaves — men, women and children — to pay his debts. This gives a prospective of what the slaves had to endure as they were being separated from each other as family members and long term friends.